Inaugural class includes state prep hoops legends. 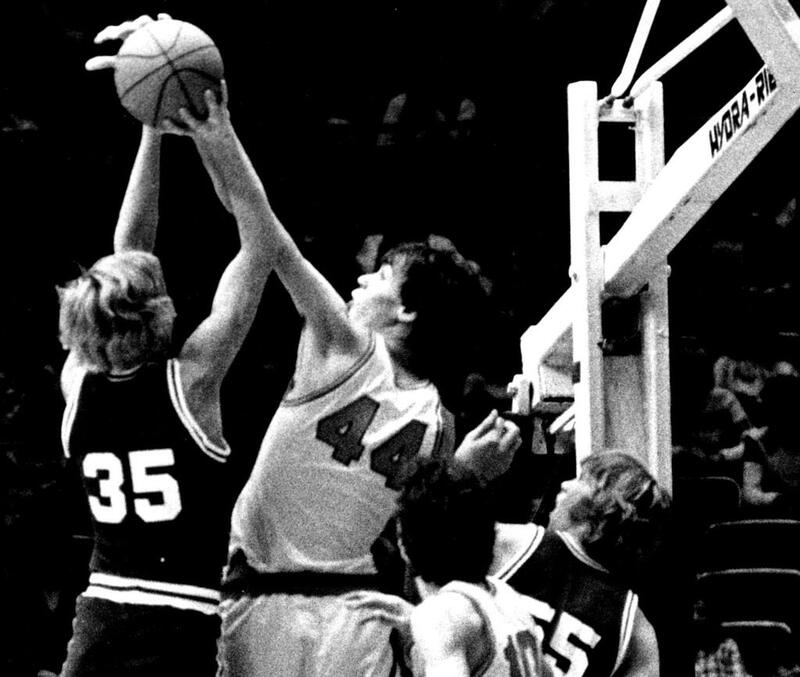 Randy Breuer (44) helped lead Lake City to Class 1A titles in 1978 and ’79. The 7-3 center's 113 points in 1979 stand as a tournament record. It’s a well-worn basketball bromide that says “You can’t teach height.” In Randy Breuer’s case, that can be easily altered: Height doesn’t get old. The 7-3 former Gophers and Timberwolves center may not have the skills he once had but he still towered above the rest of the honorees — literally but far from figuratively — at the inaugural Minnesota High School Basketball Hall of Fame induction ceremony Monday at the Courts at Mayo Clinic Center. “What a great honor,” said Breuer, 57, whose status was enhanced by being the U’s first great big man. “Well, if you don’t count Kevin McHale or Mark Olberding or guys like that,” he deadpanned. Like many, he was unaware until he was chosen that there wasn’t a high school basketball hall of fame in the state. “I was kind of shocked that we didn’t have one,” he said. Breuer led Lake City to Class 1A state championships in 1978 and ’79. Joining Breuer was a wealth of basketball nostalgia. There was 99-year-old Beulah Ankeny, one of the last surviving members of the Grand Meadow girls’ basketball teams that won 94 consecutive games from 1929 through 1939. Ten members of Edgerton’s 1960 underdog state championship boys team who wrote their own version of “Hoosiers” showed up. There was former Minneapolis North star Khalid El-Amin, along with two girls’ basketball coaches: now-retired Myron Glass of Rochester Lourdes and current Minneapolis Edison coach Faith Johnson-Patterson. New York Mills legend Janet Karvonen-Montgomery, now a pastor at Incarnation Lutheran Church in Shoreview, and current Lynx star Lindsay Whalen were honored, as was Dorothy McIntyre, a former Minnesota State High School League director who was instrumental in the addition of girls sports. Jim McIntyre (no relation to Dorothy), who led Minneapolis Henry to state titles in 1944 and 45, and Ron Johnson, who starred at New Prague in the 1950s, were honored posthumously, their families accepting the award. McHale, Olberding and Bob McDonald, the legendary Chisholm coach who won more than 1,000 games, were unable to attend the ceremony but had representatives accept it for them.